Junior Anna Shields races ahead of the pack in an outdoor meet last season. The team begins the 2018 outdoor season this Saturday at the Cal U Early Bird Invitational. 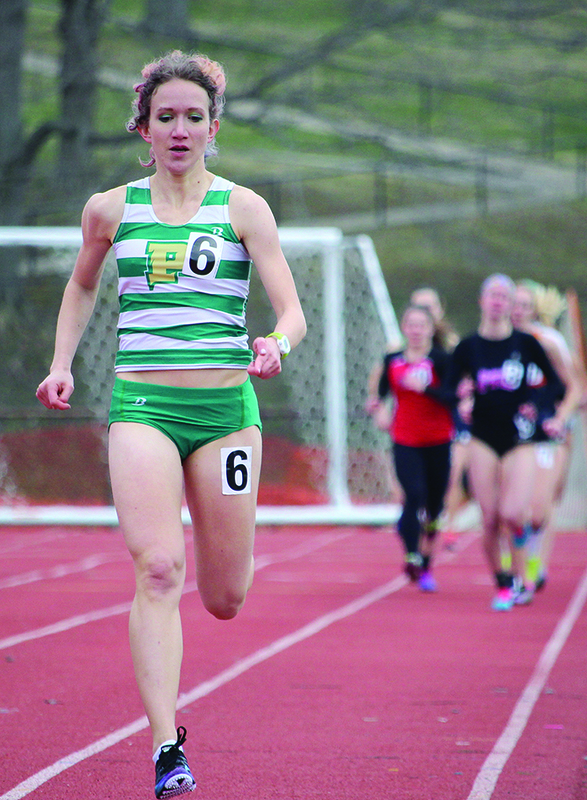 Anna Shields finished the indoor track and field season with a number of accomplishments. From being named the conference Indoor Track Athlete of the Week five times to being named the NAIA Women’s Indoor Track National Athlete of the Year, Shields racked up every honor in between. Shields highlighted the women’s team at the indoor national competition when she claimed two NAIA national titles in the 1,000 meters and mile, recording new personal bests and almost breaking the meet records by 0.41 and 0.4 seconds respectively. Last year, decorated Nigerian runner Aminat Olowora beat Shields in the mile event. This year, Shields took home the gold. The Oklahoma City University athlete had never lost an NAIA championship race before. Shields is all too familiar with losing. During middle school, the Torrington, Conn. native began running well and noticed she was already competing on the national scale. A number of state championships, state records and offers from Division I schools later, Shields’s ability began to decline. Scrambling to find a school, Shields reached out to Central Connecticut State University to find a coach who would give her a chance. “I ran even worse,” Shields said. Shields admitted she would give her best effort, but she continued to run worse. The coach who signed her left after her freshman year, and the new coach suggested she think about quitting. Shields finished two full years of school, but only one full year of athletic eligibility. Losing the athletic scholarship forced Shields to find a full-time job. “It became more important to me to be independent, so I got my own place and was living on my own working a few different jobs to try and support that,” Shields said. Shields realized that finding a job without a college degree is frustrating and depressing. Shields continued to stay active minimally after work following her withdrawal from Central Connecticut. At 25 years old, Shields decided she wanted to start training again. Training inspired Shields to return to competing. Shields could not have been more wrong. 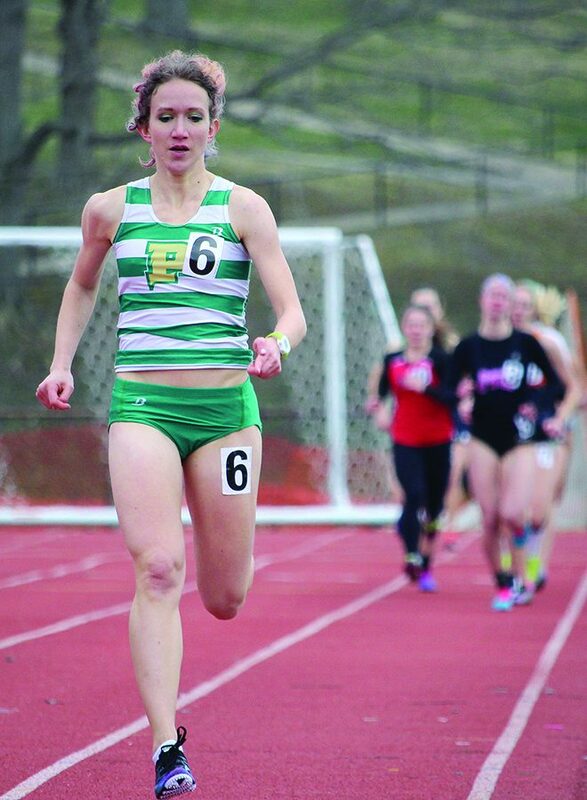 The junior cross country and track athlete has piled on the accolades since her first season at Point Park. Parsley acknowledges Shields doesn’t love cross country, but she appreciates and values it. On the other hand, track is a “whole other animal” for Shields. Shields finished the indoor season with the top times in the NAIA in the 800 meters, 1,000 meters and mile and the second best time in the 600 meters. Shields’s college-bests are 2 minutes, 7 seconds; 2 minutes, 47 seconds; 4 minutes, 37 seconds; and 1 minute, 33 seconds, respectively. Of these first-place events, Shields also runs the best times in all three compared to women’s track and field teams of local Pittsburgh schools University of Pittsburgh, Duquesne University, Carnegie Mellon University, Chatham University, Carlow University and Robert Morris University. Shields has started to create in Point Park athletics. She was named to the All-River States Conference (RSC) First Team and qualified for nationals in her past two cross country seasons. Shields placed twelfth at the national meet this past season with a time of 17 minutes, 50 seconds, a national meet record for the Pioneers. The track star has qualified for nationals in multiple events in her past two indoor seasons and last year’s outdoor season. She was named NAIA Outdoor National Track Athlete of the Year during the 2017 season and gained the honor once again this past indoor season. Shields has won seven NAIA All-American honors since her debut and claimed conference and national track athlete of the week 12 times across cross country and track. At 27 years old, she’s only just scratched the surface. “She’s getting [awards] so fast and so many, there’s a chance we might miss a few,” Parsley said. The smallest victory means everything to Shields. Shields represents Point Park as a better athlete than she’s ever been. Shields joins the women’s squad this Saturday as the outdoor season kicks off with the California University of Pennsylvania Early Bird Invitational. She aims to drop her outdoor personal bests and run times that will allow her to run in top-level races over the summer. “I hope I will be able to establish myself as someone who can compete at a high level and set up the pieces for possibly having a pro career post-graduation,” Shields said.